While all orthodox Christians believe in the trustworthiness and reliability of Scripture, there is much confusion and disagreement about what it means to call the Word of God “true.” Whether it is Ken Hamm on Genesis, science, and world-origins, or archaeologists on camel bones, everybody seems to want to prove or discredit the Bible on the subject of its historical accuracy. Situations at places like Bryan College are not helping (Google it if you don’t know about it). So, can there be any way forward in discussions about the nature of Scripture? Yes there is, says Michael Graves (Wheaton College). 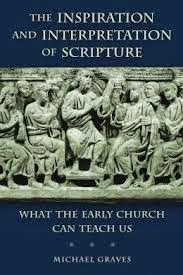 Graves has written a nice little book called The Inspiration and Interpretation of Scripture: What the Early Church Can Teach Us (Eerdmans, 2014). Graves does not treat the Church Fathers as infallible, but he believes that, because they lived historically and culturally closer to the world of Scripture and the apostolic age, they can teach us much. And he has done a fine job making that case. The bottom line for me is this: Graves’ book is outstanding because you have such a handy resource, all in one place, for studying how the Church Fathers thought about Scripture. Many of you know that the Church Fathers did not have explicit and detailed discussions about the nature of Scripture in the way we do today, so when they do, you have to pay close attention, and you also have to learn inferentially from the way they use and cite Scripture. This is what Graves offers and it is very helpful. In the introduction, Graves gives us a window into how ancient writers (Christian, Jewish, or other) thought about and approached religious texts in general. He noted that they had a tendency to look for allegory in stories, they inspected linguistic details closely, took interest in word etymologies, and always mined ancient texts for modern relevance (see p. 10). Graves does not recommend these for modern reading of Scripture, but it is useful to understand cultural tendencies of the times. The book is comprised of five main chapters: Usefulness [of Scripture], The Spiritual and Supernatural Dimension, Mode of Expression, Historicity and Factuality, and Agreement with Truth. One point that Graves makes regarding the historical accuracy of Scripture is that, by and large, the Church Fathers defended the direct factuality of the text, but for some there were occasions were problems were recognized. In such cases, for some writers, “problems at the level of factuality or historicity signaled the presence of a spiritual level of meaning” (105). I think the conclusion of the book, in itself, is a must-read for all students of Scripture. When it comes to lessons learned from the Church Fathers, Graves boils it down to this: “Above all, ancient Christian thinking about inspiration shows us that we must interpret Scripture in light of its divine purpose: to guide people in knowing and following God” (133). Graves sees the modern church as overly obsessed with the ad litteram sense of Scripture to the neglect of “the contemporary significance of Scripture” (134): “If Scripture is to speak credibly to contemporary Christians, the exposition of Scripture must move beyond simply recounting the ad litteram sense toward reasoned theological interpretation set forth with charity” (135). (2) Proper interpretation of Scripture must happen in and through the Church. That does not mean universities should not study the Bible, but the very purpose of Scripture’s existence is to form a people with a mission and ministry in service to God and world. That should never be left out of the picture. (3) Scripture’s teaching must be “worthy of God.” I think Graves means that there is a moral dimension to all biblical learning (but I must confess I didn’t follow explanation of this). (4) Good biblical interpretation requires “divine illumination.” Again, Graves is not arguing that non-Christians get everything wrong about the Bible. Rather, “As modeled by Origen, the mysterious insight that allows us to perceive the meaning of the gospel for us in Scripture comes through prayer and receptivity to divine illumination (137). This book repays the patient reader far more than I could express in a brief review, but I do think Graves has provided a healthy opportunity to drive the discussion of the nature of Scripture forward by honoring our Fathers who came before us and thought a lot about how to study Scripture properly. Graves helps us see that, even though we should not turn the clock back to a supposed golden age of belief before the Enlightenment, we have much to learn from the past – especially how the ancients treated the Bible as Holy Scripture – not just an inviolable Christian constitution (to be defended even if by war), but as a spiritual book that connects God to his people in a special way to form and grow them up in the faith under Lord Jesus Christ and through the power and work of the Holy Spirit. Nijay Gupta has written a review on this book, which sounds like a great resource.